The Federal Reserve slashed its benchmark interest rate, the fed funds rate, to nearly zero during the financial crisis and maintained the emergency rate well into the economic recovery. Fast forward to December 2015, and policymakers began what turned into a series of nine, 0.25 percentage-point rate increases. Within three years, the Fed had lifted its key rate to a range of 2.25% – 2.50%. Now, the Federal Reserve is sending signals it is nearing the end of this cycle of interest rate increases. Here’s a look at where we were toward the end of last year and where rates might be headed as 2019 progresses. By itself, rate hikes aren’t necessarily something to be avoided — as long as they’re in response to a strong economy. After all, if money remains too cheap during an economic boom, it can generate too much inflation and asset bubbles. Besides, stocks performed admirably during much of the rate-hike cycle, with the Dow Jones Industrials hitting a record high after the eighth rate increase in September 2018. Why? The short answer: economic growth lifted corporate profits. But investor sentiment began to shift following remarks made by Fed Chief Jerome Powell in early October last year suggesting the Fed was poised to maintain an aggressive stance far longer than the markets anticipated. During an interview, Powell said he believed the fed funds rate was “a long way” from neutral (a rate that neither stimulates nor restricts growth). Wall Street began to fret that the Fed was missing the bigger picture. Investors worried that raising interest rates would be exactly the wrong thing for the Fed to do in the face of global trade tensions, rising tariffs, moderating growth at home, slowing global growth in China and Europe and Brexit turmoil. In reaction to what seemed to be a perfect storm of geopolitical tensions and uncertain policy directions, equity markets around the world responded violently with a sharp correction. Enter January 2019, and the Fed chief appears to be on-message, emphasizing flexibility and stressing the Fed is in no hurry to raise interest rates. Moreover, the Fed shifted gears on the balance sheet, signaling that it would also wrap up its plan to shrink its balance sheet earlier than anticipated. These significant policy announcements clearly demonstrated the Fed’s pivot to a measured and gradual approach. Of course, it isn’t Powell’s job to react to every bout of market volatility but he must not ignore the message of the markets either. With so many factors at play, it made sense for the Fed to take notice. The Fed’s patience and willingness to pause in the rate hike cycle dramatically boosted investor enthusiasm and led to significant gains for both stocks and bonds in the first quarter of 2019. Powell had demonstrated his ability to respond to a changing global economy and he was growing into his job as the public face of the Federal Reserve. The Fed doesn’t see a recession near-term and neither do we. Powell believes the U.S. economy is healthy, but he also noted that crosscurrents have surfaced. Furthermore, U.S. inflation remains contained while disinflationary pressures have emerged in Europe. This has given the Fed breathing room on rates. Given the current economic backdrop, the Fed’s flexible and transparent approach is a positive. Fed monetary policy will continue to be largely "data dependent" but may also include a willingness to listen to signals being telegraphed by financial markets. That said, there is no promise that the Fed is done hiking rates. Given today’s jobless rate of 3.8%, a rebound in economic growth later this year could prompt another uptick in rates in early 2020. But the bar has been set high for additional tightening and recent global data likely points to more sluggish growth in the near term. 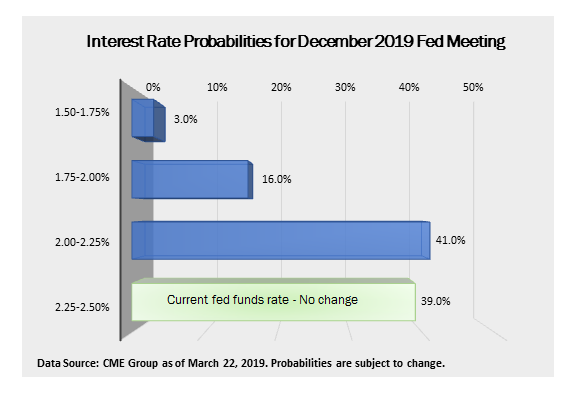 While sentiment can and does change swiftly, the chart below illustrates that investors currently place odds at 39.2% that the Fed policy will remain unchanged in 2019. Notably, investors now actually assign an even greater 60.8% probability of 1 or more rate cuts later this year. While many factors come into play when we develop a financial plan, the hardest part for many investors is sticking to that plan when markets get choppy and confusing. We experienced some significant swings in 2018, and we may see them again this year. Those investors who remain disciplined during volatile markets have historically reaped superior long-term rewards. If you have any questions about how your portfolio might be impacted by the current Fed stance, or you’re looking for broader investment guidance, our experts are here to help. Please feel free to reach out to us and schedule a personal consultation.